The glorious Rainbow Batmen of Detective Comics #241 might have narrowly missed out on DC Collectibles' poll about bringing back scrapped figures, but you can't keep a good multicoloured Batsuit collection down - it looks like the Bat-Rainbow is coming to Funko's Pop! Vinyl collection. 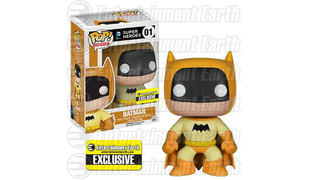 Beginning with the Yellow Batman exclusively at Entertainment Earth, Funko will be releasing a set of their Batman Pop figures based on the classic comic cover, although it's a bit of a bummer they're being released individually rather than as a set. I mean, you can't just have one slice of the Bat-Rainbow, you have to have all of it! The Yellow Bats is the only one revealed so far, so it's unknown whether they'll all be available there. Or maybe each different coloured Batman will be exclusive to a different retailer. Now that would be really insidious. Forget I said it, don't give them ideas! I'm really glad that in the last year or so DC have embraced merchandising the sort of goofier, weirder side of Batman, between things like this and the cavalcade of Batman '66 products. Sure, he's the dark knight and I love him for it, but I love a good bit of camp Batman silliness every once in a while. The first Batman in the rainbow collection will be available in May, for $13.